The quilts I am entering in to Blogger’s Quilt Festival this season are ones that my regular readers know well, so thank you for bearing with me if you have read all about these quilts before. If you are new to my work, welcome, and I hope you enjoy my entries! My submission for the Original Design Category is Synesthetic Alphabet. Below I have a short synopsis and finished photos of the quilt followed by much more detail on the inspiration and process I went through to create this special quilt. My husband has multiple forms of what is known as synesthesia. Synesthesia is an interesting neurological phenomena where sensory experiences are combined. Many synesthetics associate vivid colors with things like letters, days of the week, or smells. In addition, my husband visualizes 3D shapes associated with many things. I designed this quilt to represent his view of the alphabet. The rows left to right, top to bottom, are his letters A through Z. To help represent the 3D way he sees letters, I quilted the outline for each of the letter blocks and surrounded them with dense, square meander quilting. This quilt project is very personal as I used the design process to understand my husband better. In the end, I think we both learned a lot by working together to create this quilt. To start, my husband described in detail what a single letter of the alphabet looks like to him when he focuses on just that letter. For instance, when he thinks of the letter “A” it has a color (yellow), and it appears as a 3D shape of the letter “A” in a black to gray gradient space in the upper left of that space. It is as if the letter is tipped and rotated isometrically such that the letter faces the upper right and the left edge and lower edge of the letter are visible. One thing that I did not really know is that he can see this overlaid with what he really physically sees with his eyes, so if the object he is thinking of is super bright or annoying it overwhelms his senses and can really bother him. From a quilt design perspective, that meant I needed to find a gradient fabric that worked with his vision. 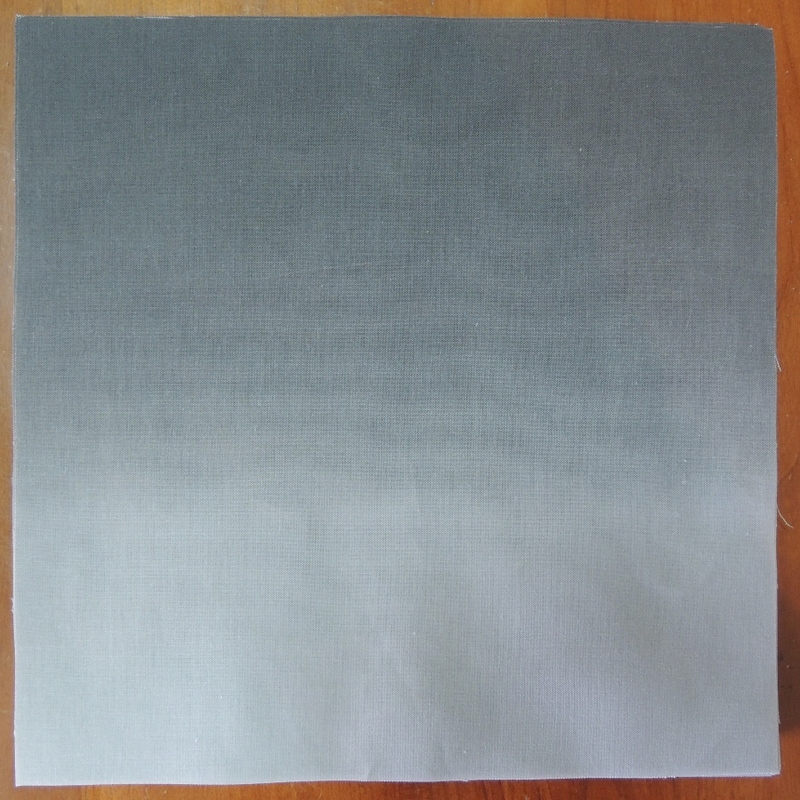 We spent a lot of time trying to find the right fabric, and in the end, a black/grey gradient by datawolf from Spoonflower was the best choice. I ordered 5 yards of the fabric and fussy cut out the portion that I am going to use for each alphabet letter block. I also spent several evenings with my husband working to select the correct colors for each letter of the alphabet. This turned out to be harder than either one of us was expecting! We found that some letters of the alphabet are a lot more “shy” or under-toned, and it was difficult for my husband to tease out what color to use to describe them. And associations with words that start with that letter do not really help; instead they seemed to make the process harder, so he would have to focus on one letter at a time and move on to another letter if he got stuck. 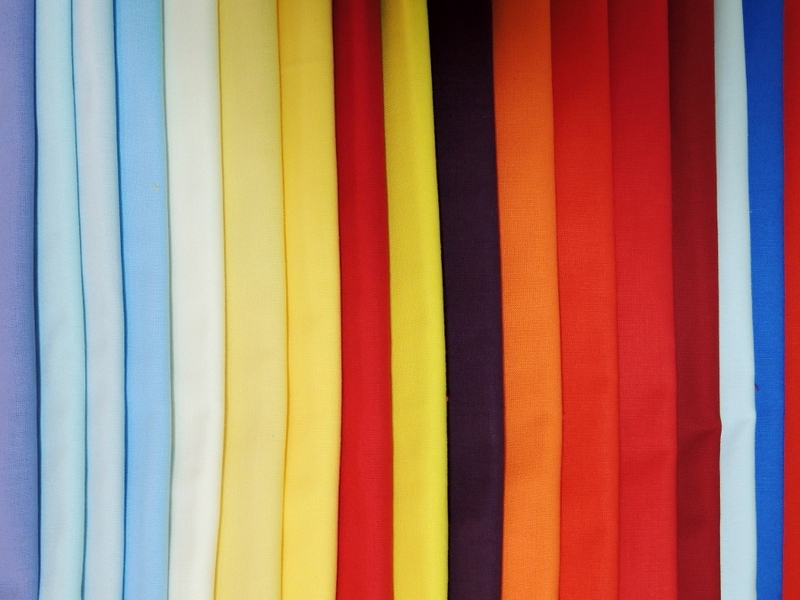 We would come back to difficult ones later (even weeks later) before finally deciding on all the correct colors. I started a spreadsheet to track the colors and see if there was any color association changes happening from day to day. It turns out that the colors are completely repeatable and the troublesome letters are always the troublesome letters! After rough sketching what the correct color for a letter would be, I pulled out my Kona solids color board, and my husband picked the correct color value. From L to R: Amethyst (G), Baby Blue (F), Blue (D, J), Blueberry (E, Y), Bone (O), Buttercup (A), Canary (T), Cardinal (Z), Citrus (L), Eggplant (Q), Kumquat (R), Lipstick (H, K), Red (X), Ruby (N, S), Sky (I, P, U, V, W), Surf (B, M), Tomato (C). To be honest, the colors are a lot more beautiful and vibrant than I pictured when we were going through the mapping process. After we had finished and before I placed the fabric order, we looked over the color pallet to see the colors not used (greens, tans, softer pastels) and we were not quite sure how the individual letter concept would map into a full quilt top. After cutting the fabrics into blocks to represent each letter and arranging them into the alphabet, a few patterns become clear. The letters that were hard for my husband to conceptualize are grouped together (the lighter blue fabrics). Vowels are all pale values of their color. Piecing this quilt top was another great learning experience for my husband and I. I had a plan to randomly place the letter “blocks” within each gradated background block. After I made the first two (“A” and “B”), I asked for feedback from my husband. It turns out that objects that are important or that are sharply in focus hang out in the middle to lower portion of space for him. As things become unimportant or if they are hard to define, they float up in space. I tried to keep that in mind as I worked on the blocks. If my husband had previously described the letter as ‘shy’ or if it was difficult for him to select a precise color, I tried to move the block a bit higher in space. 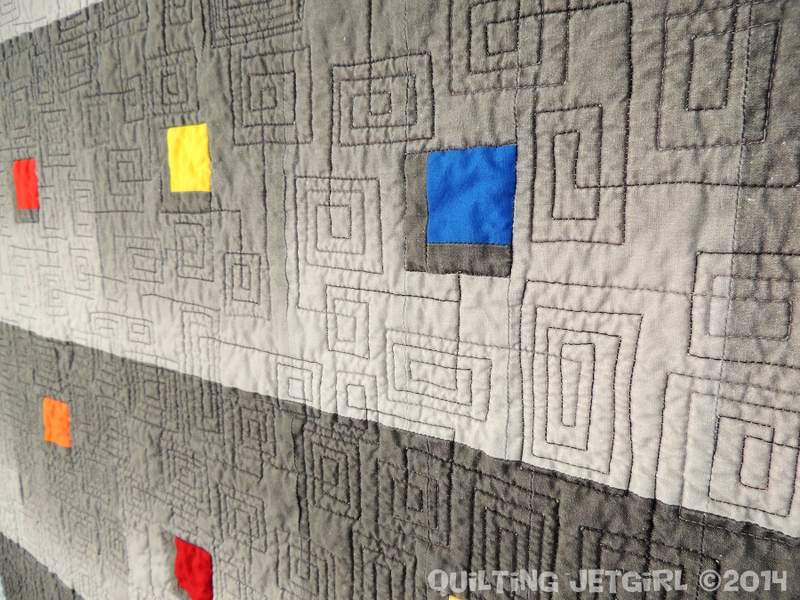 When discussing how to quilt and finish the quilt, my husband and I agreed that outlining the letter blocks with dense quilting all around will help enhance the 3D effect by allowing them to pop and puff up a bit more. He also requested “robot” as the quilting pattern. I used a variegated black and white thread for the top and a variegated multicolored pastel thread for the back. Speaking of the backing, I cut much larger blocks of the colors for the letters of the alphabet and arranged them in A through Z order for the back. To finish out the backing, I used the paler portions of the grey gradient fabric selected for the top to border the letters. Creating this quilt was an amazing process, and I loved how it allowed me to learn more about my husband. What a special and meaningful quilt. Thank you for sharing your process and good luck in the blogger’s quilt festival. Even tho I have read about it before, it was interesting to read it again. It would be nice if all who were voting had the chance to really read through the description of how your husband visualizes things. And quilt is still wonderful! Great choice for the festival. It was fun to see this quilt again and read its story. This one is great! I’m glad to see it in the festival! It was great to see this quilt and re-read the story. I love it. This quilt has such a cool story! I love how you took everything you learned from him and adapted it into an art form. So inspirational! What a wonderful synthesis of your husband’s neurological phenomena and your talents. Your quilt stands on its merits as a wonderfully graphic quilt, but its impact is so much more when you read its story. What an interesting story and then to put it in quilt form…beautiful! Wow, that is amazing Yvonne! I don’t think I knew the story behind this quilt. It makes it that much more incredible. Thanks for sharing and good luck! I hadn’t appreciated all the process that went into this quilt before, must make it a really special one for both of you. WoW…. not only is your story amazing to go with this quilt, the quilt is amazing and the story just makes it that much better! Totally inspiring and I love how you were able to take something from someone elses view and give the world a glimpse of it. WoW! 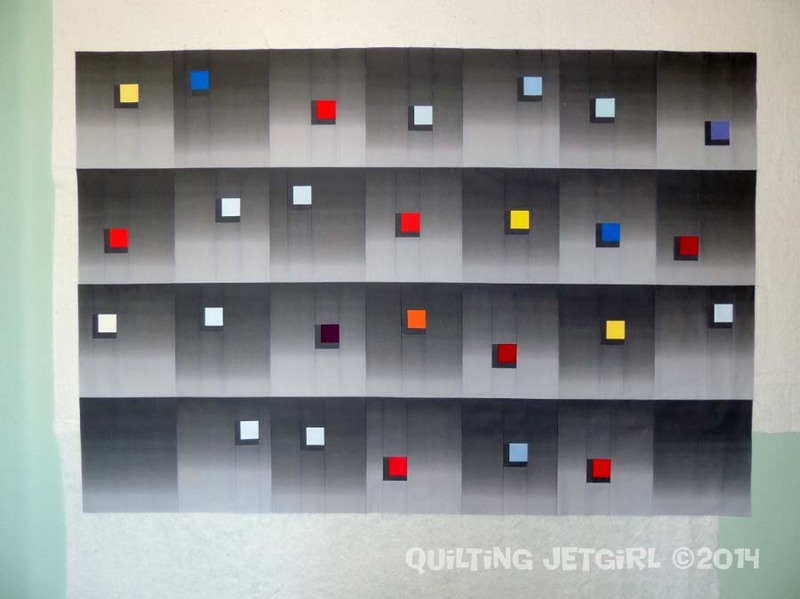 Thanks for sharing your process – it’s a really striking quilt! I had a roommate who has synesthesia; she also saw letters as colors. Great quilt and wonderful backstory. I loved reading about the design process. Congrats! 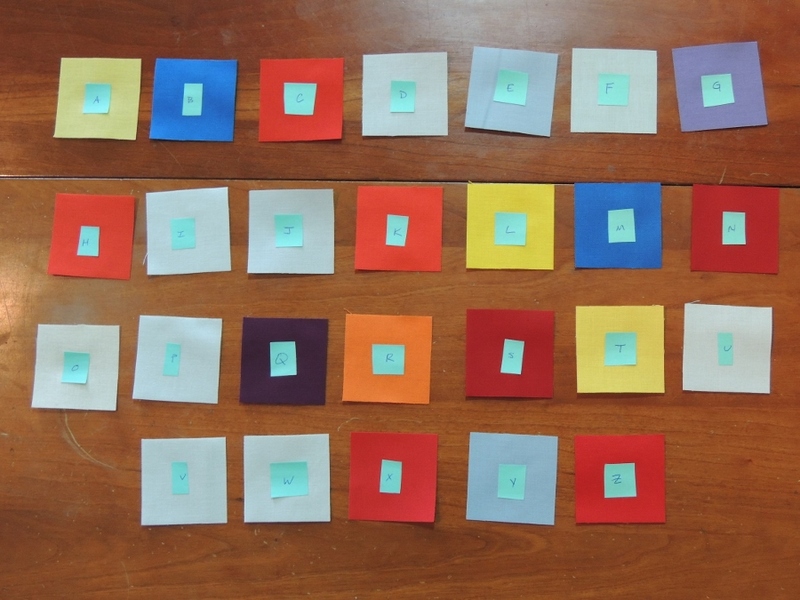 Thank you for sharing this quilt and your process – I was not aware of synesthesia until now. What an great project for you two to work on together. I really love the use of the ombre grey. It has been so interesting reading the story behind this wonderful quilt! Such a great quilt! Good luck in the festival. So interesting! I love it! A really cool quilt and an even cooler process and story! Wow fascinating! I have heard a bit about synaesthesia and it’s amazing to see it conceptualised in this way. 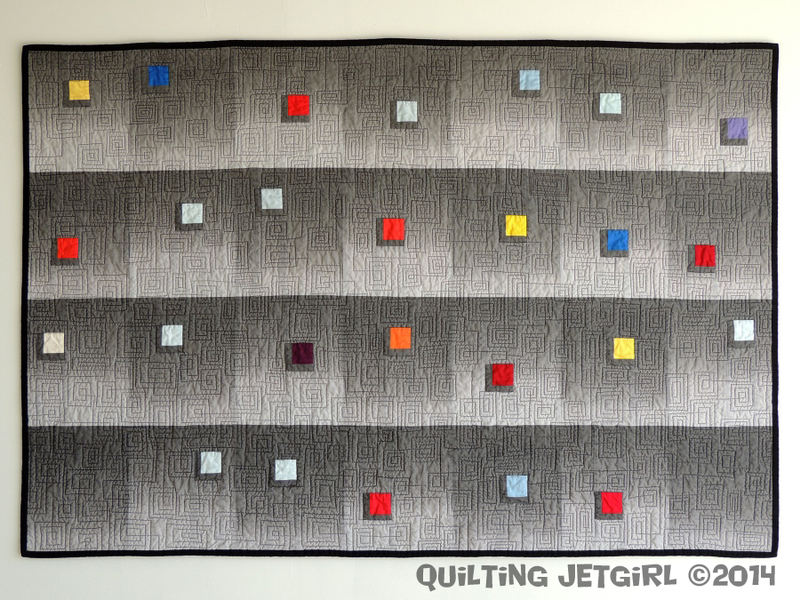 It makes a really beautiful and subtle quilt. One of my favourite in the festival! Really cool quilt even without the interesting story. I like the simplicity of it, but it really pops. Well, inspiration comes in many forms! I’ve heard of synesthisia but never met anyone with it. How fantastic that such a wonderful exploration of experience should produce such a beautiful quilt. It is very effective in its own right. The use of the shaded grey, the 3D underlining, the variation of the coloured squares all work together. And I love the FMQ. Fantastic quilt, it really has that something special, catching the eye, and when I read the story behind it… just WOW! I voted for it before I read the story – now I wish I would have 2 votes! The brain is such a wonderful thing and how mysterious. Reality is what one makes of it. Art and quilting is just one way to try and show others how our incredible brains interpret the world. Lovely piece! This is amazingly cool. I think the cooperation between you and your husband to make this quilt is so special. Very, very cool. What an incredible collaborative process, and an educational tool for the public as well! Did you know that, Sharon Schamber, one of the best quilters ever, has the same condition as your husband? Thank you for sharing, I have the utmost respect for what you have accomplished here. Omg! This is amazing. I decided to visit your blog because I really liked the patterns and colours and what I have read is just amazing. Wow!!! Congrats this is both a work of art and a work of love! OK, I popped over here because this quilt was visually quite interesting just from a tiny thumbnail…but after reading how this came about I am totally flabbergasted! What a fascinating project, with stunning results! Thanks so much for sharing all this!!! Well. All I can really say is WOW! What a beautiful quilt! And the meaning and process is a full-on education in itself. Thanks so much for sharing and teaching. Totally WOWED!! Holy cow this is really amazing. I am impressed to read the story and details of the process and quilt. I’m glad I found your blog. 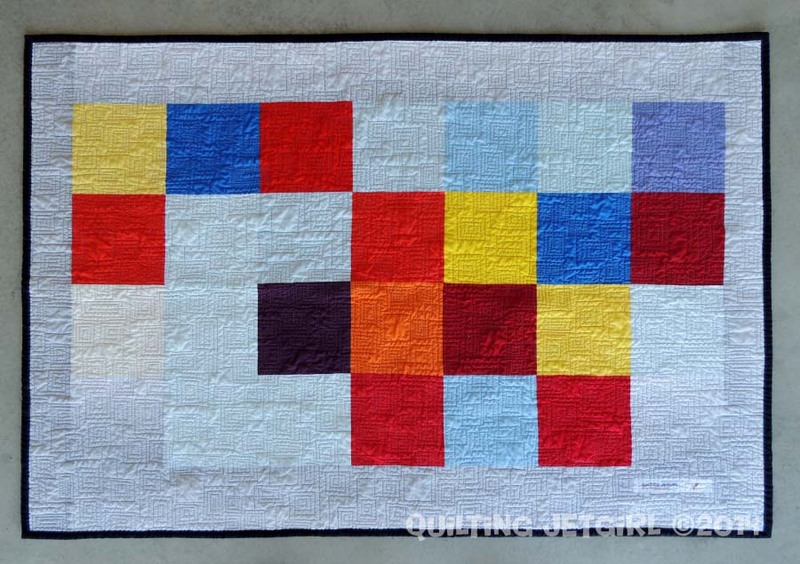 This quilt is so conceptual and striking – love it! Just amazing. You’ve described and detailed the synesthesia so well. A great job putting it in fabric form. Wow, that is incredible! I have a young friend with this kind of Synesthesia and your post helped me understand it a little bit more. AND the quilt is stunning! Years ago, we saw a documentary on synesthesia and, as a nurse who’d never ever heard of it, it was so very interesting, amazing, and oh, so complicated for those interviewed to explain. Your quilt and the diligent work you and your husband put into it to get it right are just wonderful. What a gift this quilt is to you two as a couple, since you made it together because you both care. I love this quilt and the story of its creation is touching. I stumbled upon your blog because of a Googled quilt photo. I am a quilting newbie, and I’m struggling and stumbling through finishing my first quilt, adapted for a daybed, for my teenage daughter. Your thoughtful blog is inspiration. My other daughter struggles with anxiety so it was with great interest I read through some of your posts. Thanks for your transparency.